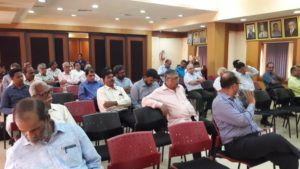 Goa Management Association celebrated Management Day 2019 on Tuesday, 19 February 2019, at the Conference Hall at the Goa Chamber of Commerce and Industry, with a Seminar on the theme of New Ideas: Innovation in the Age of Disruption. GMA invited four prominent professionals from the startup ecosystem to present their views on their journeys in setting up disruptive enterprises, to discuss innovations and their impact on constantly evolving technological landscape, and the support system for aspiring startups. Presiding over the seminar, Mr. Harshvardhan Bhatkuly, Chairman, gave some insights on GMA and the Management Day and set the tone for the deliberations, citing examples of OYO, Swiggy, Uber, etc. where disruption occurred due to innovations from outside the industry sector. Mr. Amin Ladak, Vice Chairman, introduced the speakers. Speaking first, Mr. Rohin Parkar, gave a brief idea about his background, experience, organisation and the nature of work being done in the realm of Internet of Things (IoT). He explained with the Nokia example, how innovation can cause disruption and lead to businesses becoming irrelevant in a short span of time. He said that organisations must create and survive disruption, in order to ride the wave of change. There is a difference between invention and innovation, and innovation can create tremendous transformational value with existing technology. Business leaders must have an open mind to all ideas, see the change and plan ahead to survive the change. He briefly explained data collection through IoT, business analytics through AI and ML, and introduced LoRa, Zigbee and Narrowband IoT concepts. Speaking after him, Mr. Prashant DS gave an impassioned presentation on the incubation environment. He said that despite 14 years of existence of incubation centres, people still are not clear about what incubation centres. The Government of India had declared 2010-2020 as the decade of innovation and in 2016, several programmes and schemes were launched to motivate startups. India has a 25 year history of startups and during 2000-04, in Goa, around 200 micro enterprises were setup. He explained that the initial experience of entrepreneurs was difficult because the reality was different from the schemes. However, persistence and focussed work at easing hurdles has ensured that in 14 years in Goa, 3000 microenterprises have been set up. The key requirement for any startup idea to succeed, he said, the person should have a problem that bothers them and a solution for it. He explained the process of incubation including base camps, basic training, likening it to Everest expeditions. Mr. Amey Salatry spoke of the legal landscape and how it also has been metamorphosed due to the changes in technology. While there is an imbalance in this change in India, western economies such as UK and US have adapted to his change, and nowadays many legal organisations offer services, which are more broadbased, offering tools and online services, which have replaced armies of legal experts in the past. Clients also are looking for legal experts who can navigate their technological changes. He also mentioned that there has been a shift in the outlook of legal professionals, who now seek a more entrepreneurial and decision making role rather than advisory roles. Speaking in the end, Mr. Fernandes, gave an idea about disruptive technological changes giving the example of the online music industry, how eMusic was launched, which led to iTunes, which led to streaming audio and then to video streaming, with the latest in technological shift being live TV. He spoke of disruptive changes to traditional payment systems caused by the invention of blockchain technology and the advent of cryptocurrencies. The audience threw up a few relevant questions, querying about the management issues behind business decisions that led to the decline of Nokia, how incubation centres can overcome the problems of complacence that arise out of the secure incubation centre and lead startups to meander, and also the ramifications of political disturbances to startups. The seminar ended with the Hon, Secretary, Mr. Anup Verlekar, thanking the speakers, the audience and others involved in ensuring the seminar was a successful event.